When it comes to dressing for winter, I’m a huge fan of layering basics. Most days my uniform consists of a good pair of leggings, a cozy cotton t-shirt and an oversized sweater of some sort. Sure, alone these pieces can seem a bit blah, especially come mid-winter when the excitement for bundling up has totally worn off, but really those winter basics are a blank canvas–all it takes is a few eye-catching accessories to pull together a cute outfit worthy of cold temperatures. 1. 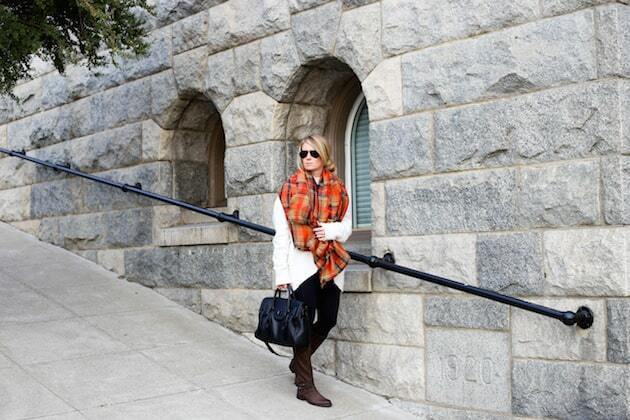 Wrap up in a bold blanket scarf. My realization this season: plaid or neutral-toned patterns can be particularly great for tying together both black and brown elements into the same outfit. 2. Have go-to handbag & sunglasses on hand. 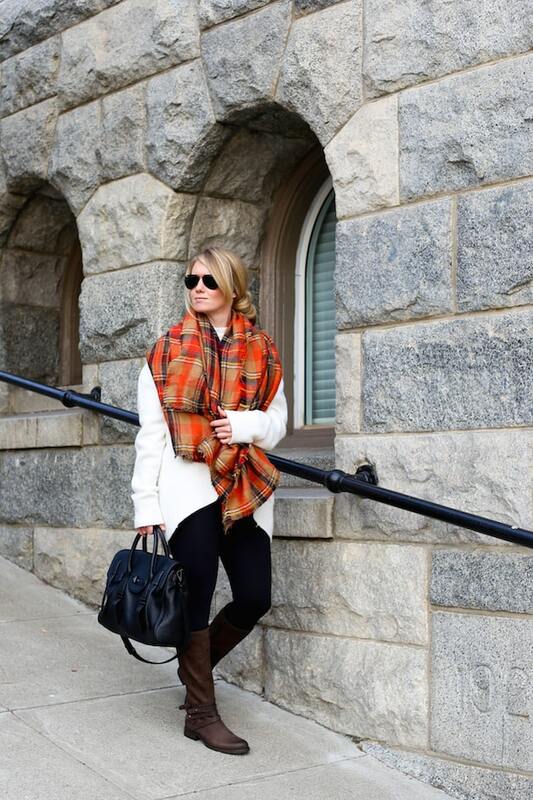 I tend to gravitate toward classic designs over trendy–particularly when pairing with a bold blanket scarf. Lately I can’t leave home without my favorite aviators and this black leather satchel. 3. Pull on some cute & comfortable boots. I’m particularly fond of riding boots because they can be dressed up or down, depending on what you pair them with. I snagged this cute pair at DSW recently. Check them out if you’re on the hunt for new boots–they have so many cute styles, these great black suede booties to boot! What’s your favorite way to dress up your winter basics? DSW is the destination for savvy Shoe Lovers everywhere. Customers experience a breathtaking assortment of designer brands at irresistible prices every day. Compensation was provided by DSW via Mode Media. The opinions expressed herein are those of the author and are not indicative of the opinions or positions of DSW. Great post and I love your boots. They are super cute. I’m a huge fan of riding boots, they just go with everything! I love the scarf…this looks great on you. that sweater looks gorgeouss on you.